In the East of England, there is a Medieval city composed of cobbled streets, secret gardens, and flint churches. Its castle stands on a hill, one of the only ones in the region, for we are deep in big-sky country. If you go left, you will find yourself in Chapelfield, a gleaming, glass shopping centre where all the classiest brands can be bought. If you go right, you will find Tombland, where the aforementioned cobbles are the most ankle-grinding, and the antique shops and cafes stand in the shadow of the cathedral. Welcome to Norwich. A fine city. Old and new, side by side. Yes, dragons came to Norwich! 204 of them, to be precise. 84 large dragon sculptures were painted by professional artists and placed in various locations around the city. Trail maps were provided, and thousands of people came to do some hunting. As well as these, 120 smaller dragons were decorated by local schools and displayed in shop windows, around the city’s library, and in Chapelfield. Officially called ‘GoGoDragons!‘, this event was organised by the charity Break. In October, the 84 large dragons will be sold at auction to raise money. Break is a UK charity, and they work hard to support young people, particularly those with disabilities, family difficulties, and children in care. Aside form the money raised by the auction, GoGoDragons! has also pulled in money for Break in the form of donations given by dragon hunters. The statues were on display from June until August, and free for anyone to look at with the choice of whether to donate or not. But based on the amount of fun we had dragon hunting, the insane number of people who descended upon the little, middle-of-nowhere city, and the sheer beauty of the dragons themselves, I can’t hesitate to say that Break must have been received a substantial amount. What I loved most about dragon hunting is the simplicity of it. Go to the library, grab a map, and you’re off! You don’t need to sign up, be there at a certain time or place, turn anything on or take anything with you. One dragon in particular had a folkloric connection to Norfolk. Meet Luda, who was stationed in the centre of Norwich’s library. Luda is painted on either side with images of the Norfolk Broads, including the iconic ruin of St. Benet’s Abbey. Around 30 minutes away from Norwich by car, there is a village called Ludham. This is by the broads, where in the days of old winters were harsh and superstition runs thick. It is from these days that the legend of the Ludham Dragon appeared. 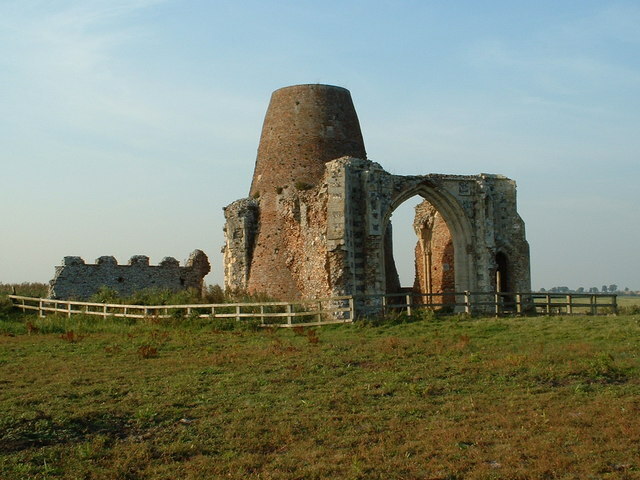 The ruins of St. Benet’s abbey, beneath which the dragon could still be living. Image from Geograph. Kieron Williamson, who painted Luda, was inspired by this legend. Not only is his artwork beautiful, it is also a physical representation of a local story. Over the course of the summer, between my mum, my friends, and I, we managed to locate all 84 dragons. We spent 4 days trailing around the city, and walked so much that we had to spend another 4 days letting our poor legs recover! After awhile, it wasn’t just about finding the dragons. It was about discovering our city, and helping others. We found places we had never even heard of before. We got lost in a place less than half an hour away from our own hometown, and it was fabulous. There were groups of all ages — children, families, teenagers, elderly people — all together for one purpose. We gave and received directions by talking to them, instead of using Google Maps. We used pens and paper to track our progress. We stopped to read sign posts, and bought refreshments at independent cafes instead of chains. So, if you take nothing else out of this post (apart from OOOOH PRETTY DRAGONS! ), then let it be this: Get out there. Don’t get me wrong, I’m not being all ‘oh life is terrible these days because kids are all on their iPads and blah blah blah.’ Technology is useful, and whether we like it or not it’s ingrained into our daily lives now. But there is still joy to be found in doing things for yourself, and learning about the places you live in and visit first-hand. Over those 4 days, I went on a DSLR rampage and took over 300 photos… oops. Those were not fun to edit! Here are some of my favourites. She has a castle on her neck, and she was standing outside the castle! My favourite dragon of all – GoGoMosaic by Carolyn Ash. So sparkly! Although they were only around for a short time, the dragons brought colour to Norwich — and also a little bit of magic! Who knows what sort of sculptures Break are planning to do in the years to come, but it seems that they have outdone themselves already. Whatever they choose, I’m sure it will be wonderful. But never quite as wonderful as the year of the dragon. That sounds like so much fun! What a great adventure!